“On the 60th anniversary of Billy Graham’s historic 1959 visit, his son Franklin has started his tour to six Australian cities, including two events in Sydney. – Russell Powell reports at SydneyAnglicans.net. ‘The Most Reverend The Primate and Patriarch of The Southern Hemisphere’ – that’s how John Newton addressed Richard Johnson, Chaplain to the First Fleet and the fledgling colony of New South Wales. Marylynn Rouse, at The John Newton Project, just in time for Australia Day, has posted a number of letters and new material relating to Richard Johnson – including letters to him from John Newton. “In the evening of the 23rd September 1786, I was asked by a friend, if I had got the spirit of a missionary, or, if I wished to go abroad. I smiled, and replied – No – I had no inclination or thoughts of ever leaving my native country. See what’s new at The John Newton Project. See also: Richard Johnson – First Chaplain to Australia. What shall I render unto the LORD for all His benefits? These words were read by the Rev. Richard Johnson, Chaplain to the Colony, on Sunday 3rd February 1788, at the first Christian service to be held after the arrival of the First Fleet. It’s a good question to ponder. 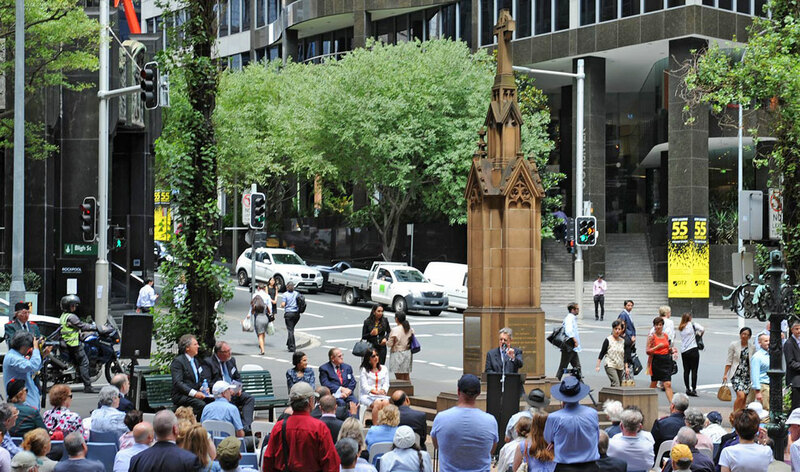 In 2015, Associate Professor Stuart Piggin gave this fascinating address at a gathering to commemorate the First Christian Service in Australia. The event, in Richard Johnson Square on 3rd February, was close to where the Rev. Richard Johnson conducted the first Christian service in the Colony, on 3rd February 1788. With Dr. Piggin’s permission, we published this at the time. We think it is well worth reading again. first carer for aboriginal children. With all those firsts, he was quite a pioneer – and John Newton, author of the much loved hymn ‘Amazing grace’, who recommended Johnson to MP William Wilberforce who recommended him to PM William Pitt, bestowed on Richard Johnson the title, ‘Patriarch of the Southern Hemisphere’, that is, if you will, founding father of the Christian movement in Australia. If Newton gave Johnson the title ‘Patriarch of the Southern Hemisphere’, what title did the Eora people, the Aboriginal people who lived in the Sydney Basin, give Richard Johnson? Well surely we must know what our Christian heritage is before we can decide if it matters. But I doubt if we have ever found what our Christian heritage is – we are in great danger of losing it before we ever find it. Nobody has ever told us. Has anyone ever told us what title the Eora people gave Richard Johnson? I will tell you at the end of this address, but my point is that there are parts of our Christian heritage we just don’t know because no-one has ever told us. Then there are other matters which we think we do know. We have been told them so often they have become stereotypes. Do read the whole address. (PDF file.) Photos courtesy Ramon Williams, Worldwide Photos. Richard Johnson’s Address To The Inhabitants Of The Colonies (PDF file). John Anderson’s Conversations: Featuring Associate Professor Stuart Piggin (June 2018). Take the time to watch. The Fountain of Public Prosperity – Evangelical Christians in Australian History 1740–1914, published by Monash University Publishing. Former Deputy Prime Minister John Anderson has been publishing some fascinating Conversations on his website. And see the other conversations already published. – At the Diocese of Armidale website, Bishop Rick Lewers reflects on what Australia needs as we enter a new year. “In my former posts (here and here), O Friend of Law and Religion, I have dealt with all that the Ruddock Report covered in recommendations 1-12 and 15, along with the official Government Response to those recommendations. – Associate Professor in Law, Neil Foster, has just posted part three of his response to the Ruddock Report. He concludes, in part, “… my general response is that the Report is a sensible document which takes religious freedom seriously, and hopefully the actions promised by the Government will be implemented with due speed”. – More from Neil Foster at Law and Religion Australia. “The long-awaited Religious Freedom Review: Report of the Expert Panel (chaired by the Hon Philip Ruddock) has now been released publicly, along with the formal Government Response. After the prior leaking of its 20 recommendations there were no major surprises as to the final conclusion, but there is much interesting background to the recommendations (and in one or two cases the full Report seems to have a significant impact on how one should read the language of the recommendations.) It is also important to see the announced intentions of the LNP Government as to how they will respond. – Neil Foster provides his first response, at Law and Religion Australia. We are grateful the Ruddock report has finally been released and view it as the start of an urgent process to frame appropriate legislation for religious freedom. This should be a bipartisan issue since it involves the harmony of our entire community, not just the more than 60 percent of Australians who identify with religious faith. Debate on this bill will continue at a later date. It seems that the bill [reportedly identical is likely to be referred for consideration to a committee, and the debate will presumably be picked up in the New Year. – Thanks to Assoc-Professor Neil Foster for this update. Photo: Leader of the Opposition, Mr. Shorten, who has introduced a similar Bill into the House of Representatives.